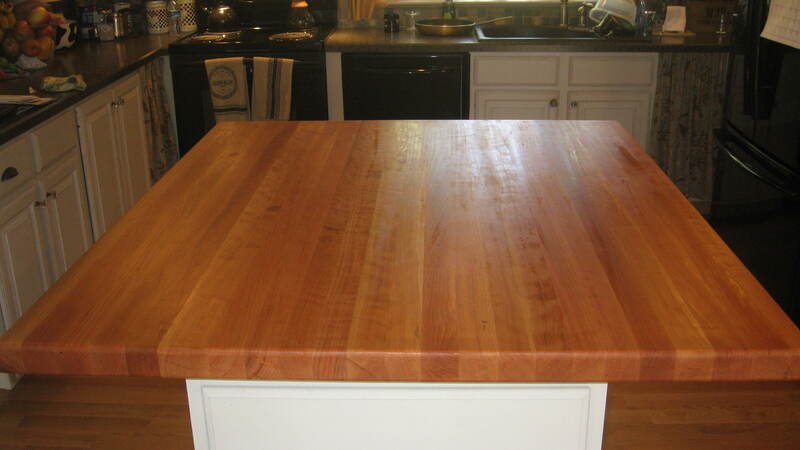 We just finished and delivered a nice cherry 51" x 44" x 2" butcher block top for an island. We glued up 11" wide sections (four of them) and then ran through my 12" DeWalt planer. All worked out well. BUT, the man at Woodcraft told me (after the fact) that I should NEVER run wood, end grain up, through a planer, as it will blow up the planer and the project. He said the planer would eventually catch on the grain and jam up the machine and ruin the wood. He said I only got lucky that it did not happen to me. My questions are, is he in fact correct? If so, how does one plane butcher block tops and individual slats for that matter (I also ran my 2" wide slats through individually to plane to 2" before gluing up each 11" section). Thanks for the help. If you have a nice tight planer, with guaranteed sharp blades and you are taking off the thinnest of cuts, you may get away with it ... but my guess is at some point it could get you. I never recommend people run end grain through the planer, either plane by hand or use a router jig for planing, or take some place that has a big belt sander and get them to take it down for you. There are safer ways than using the planer and risking injury and or damage to the tool. I was reminded that I said "end grain" when what I meant was "edge grain." My planer was used to plane the edges of the boards (edge grain). Does the warning about using a planer remain still? Ah ... edge grain, that's a huge difference, yes no problem running ANY long grain through planer, flat grain, edge grain etc, they area all fine, it's the end grain that can cause problems. When I looked at your your pic, I was wondering if this was the same issue or another picture or ??? That clears it up for me. Good Question. I actually stumbled upon a youtube video which clearly shows the problems that can occur when running end grain cutting boards through a planer. Enjoy!